Thin wool roving strands for wet and needle felting. 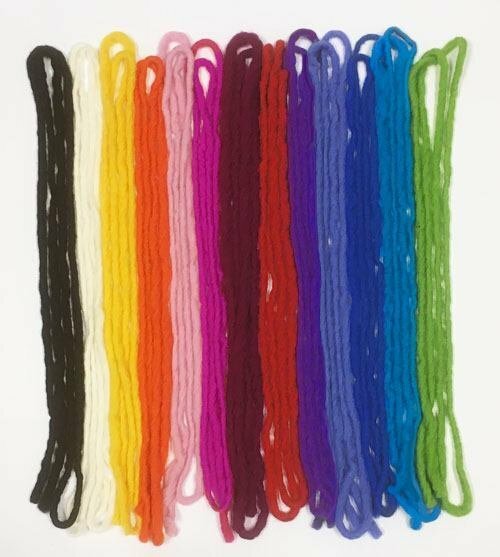 Pencil roving is wonderful for felting thin lines into projects, for making letters or felting words, borders, flower stems, or any other long felting lines that you want to be consistent and easy to use. This pencil roving is actually a very thick, lightly spun single ply yarn. It felts well and is wonderful to add lines, borders, letters, and so forth to felted projects. By the piece or an assortment bag of all the colors. Each piece is roughly a yard and a half to a yard and three quarters long. This pencil roving is actually a very thick, lightly spun single ply yarn. It felts well and is wonderful to add lines, borders, letters, and so forth to felted projects. Assortment bag of all the colors in the picture above. Each piece is roughly a yard and a half to a yard and three quarters long.